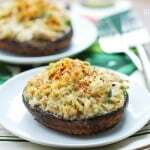 A gorgeous dish of crab stuffed mushrooms, great as an appetizer or a main course. Make sure the crab meat is fresh, and follow the directions give to avoid soggy mushrooms. Preheat the broiler, setting the temperature to high. Set oven rack in the middle of the oven. Line a baking sheet with foil. Spray the mushroom caps with olive oil cooking spray on both sides. Broil 5 minutes on each side, or until just tender. Meanwhile, transfer the crab to a medium bowl, feeling through the meat to make sure no shell pieces remain. Add the remaining ingredients except for the paprika and mix well, with a fork or a spatula, to combine. If the mushrooms have released water, drain them on paper towels, then fill the portobello caps with the crab mixture. Sprinkle with the paprika. Broil 2-3 minutes, just until the filling is warm and golden.